Few characters could have potentially benefited from the DC Comics New 52 relaunch more than Hawkman. After DC's last major reboot, 1986's Crisis on Infinite Earths, Hawkman's continuity became horribly muddled, a morass of false starts and retroactive changes that series by Tim Truman, John Ostrander, and Geoff Johns, among others, couldn't fix. For Hawkman to receive a fresh start, finally well and clear of his own continuity and anyone else's, would be a godsend. Fortunately for the reader but unfortunately for the character, Savage Hawkman gets a new creative team after its first collection, suggesting an initial stumble already for the character (Fury of Firestorm, Grifter, and Voodoo have the same situation). And writer Tony Daniel (with James Bonny) and artist Philip Tan's Savage Hawkman: Darkness Rising is also unfortunately bland, a Hawkman who's neither savage nor well-presented. All of this leads to a disappointment for Hawkman fans and signs that even in a new universe, the Hawkman character's troubles aren't quite over. Savage Hawkman goes wrong at the outset in that its first four-issue arc only contains enough material for one- or two-issue story. The archeological laboratory for which Carter Hall translates alien languages accidentally looses a sentient alien plague, which steals some of Hall's Hawkman uniform's Nth metal and escapes. What follows are repetitive scenes of Hawkman and others fighting the monster, Carter trading repartee with his boss's daughter Emma, and the book's villain du jour Dr. Kane making evil pronouncements, in different combinations until Daniel brings it all to a close. The other characters direct Hawkman around more than he acts himself in the story, and moreover, the first arc isn't really a Hawkman story. Hall is an archeologist; he has an uncanny, unexplained ability to read alien languages; and he wears the Nth metal armor, the book's McGuffin that everyone wants -- but the Nth metal could as easily be the Speed Force and Hall here could as equally defeat his enemies by running fast as flying and smashing things. 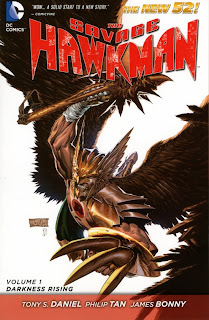 Inasmuch as a "Hawkman story" is hard to describe -- one that deals with Thanagar, perhaps, or the most recent reincarnated Hawkman's past lives -- Darkness Rising fails to get to the core of who Carter Hall is or why he does what he does. Both of those genres of "Hawkman stories" get a nod -- the first arc deals with various alien races on Earth, and the second has Gentleman Ghost, an enemy especially of the resurrected Hawkman -- but the reader never gets the sense a typical Savage Hawkman story might evolve from Hall's job, or from him protecting a certain area or working for or against a certain group, for example. This vagueness is inherent throughout Darkness Rising, beginning with the opening scene in which Hall tries to burn the Hawkman armor, suggesting that someone has died because of him. Many of the New 52 titles have avoided the characters' origins, leaving that for the special zero issues after issue #12, but in Savage Hawkman it has the effect of saddling the reader with a Carter Hall who's often dour for no reason the reader can sympathize with. Especially for a character like Hawkman, the fact that the reader doesn't know how Hall received the Nth metal armor to begin with, to what extent his origins are alien, and what he's done as Hawkman thus far, makes it difficult to embrace the title. Daniel does add an interesting aspect to this new Hawkman in that his armor is now a part of him, emerging when there's danger -- it's a cool visual, though already in use in the New 52 by Superman and perhaps too similar to the Flash's ring. There's also an aspect of secret-identity play to Hawkman, as Hall has to explain to Emma where he's been or find excuses to run away, which has been missing from the "old" DC Universe. If corny, this is charmingly corny, and especially intriguing for Hawkman when it's been ages since his identity was private. Co-writer James Bonny comes on with issue #5, which marks a mini-restart for the title as Hawkman gains a young sidekick, Singh, and a rootop apartment. Singh, however, is a mess of stereotypes -- he calls Hawkman "bro," asks for Emma's "digits," and actually says "Hate the game, not the playa'" -- and again within him it's hard to see a consistent vision for what the Hawkman title is supposed to be. Daniel and Bonny's Hawkman/Static team-up in issue #7 is cute, though the quipping Hawkman is inconsistent with the character thus far. Issue #8 gives a tacit nod to the New 52's ongoing Daemonite invasion plot, but the fact that the word "Daemonite" is never even used makes this seem more like a series in want of a story than a real plotline. On the art side, Philip Tan's Hawkman redesign is nice to look at, considerably more modern than previous artists' riffs on Hawkman's Golden Age costume. Tan, with colorists Sunny Cho and Imaginary Friends studios, have a sketchy, water-colored take on the art that's attractive and serves well when Hawkman's armor goes up in flames in the beginning; there's good consistency, too, that the same watercolors appear in Cliff Richards's guest-issue. The fine lines become too distorted at times -- in the fifth issue, Carter's head is weirdly-shaped, for example -- but Savage Hawkman's art gives it good character overall. But that said, Savage Hawkman: Darkness Rising is another book for which it wouldn't be worth checking out the second volume, except that DC has revamped the creative team -- and, after Rob Liefeld left the title after the second volume, revamped it again. There's some things to come, including a Green Arrow guest appearance and Hawkman's upcoming membership in Justice League of America, that make it worth giving Hawkman a second look; it's just too bad that so far, even in this new reality, Hawkman still can't seem to catch a break. We're getting ready for the end of the year, but before we go, it's the long-awaited Collected Editions review of Kyle Higgins's Nightwing: Traps and Trapezes. Don't miss it, later this week! Other than All-Star Western (which was alright, but not good enough for me to overcome my apathy toward Westerns), this was the only New 52 book I dropped after only two issues. I was going to give it another try after Daniel and Tan left, but I gave up as soon as they announced Liefeld would be plotting it. Even after his exit, this series has yet to get a new regular writer, which leads me to believe its days are numbered. It's a shame they couldn't get Hawkman right, even after finally giving him a chance to shed all of that continuity baggage. I've heard Hawkman described as "Conan with wings" if done properly, so here's my pitch. Combine Hawkman with Warlord. Carter Hall finds himself in the hidden inner world of Skartaris. Armed only with his wits and a mysterious pair of wings, he fights against the world within to prevent it from invading the world without. I'd provide more details, but all things considered, I might hang on to the details and pitch it myself. Hawkman will get a big bump thanks in part to his inclusion in the Justice League of America next year, so continuing his solo series will happen. Unlike Green Arrow getting redemption for having Jeff Lemire and Andrea Sorrentino coming up(which we all can guess is going to be huge), as well as the ARROW television show giving the character even more credit...but Hawkman doesn't have the same saving grace about it for the future. 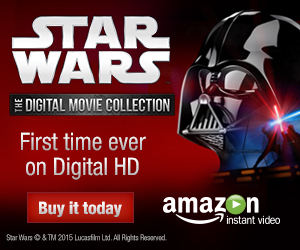 It doesn't have a set writer either, which doesn't sound too good. Again, Carter will get some media attention thanks to Geoff Johns JLA run next year, but as his solo series looks...it doesn't look too bright. Doug, I love your pitch. Sounds like something Mike Grell ought to do (if not you yourself). @Lionheart, now I want to see Carter Hall appear on ARROW. I bet they could do it, low-tech with just a couple references to birds. And then Laurel could be like, "Hm, birds ..." and we're off to the races.